Gneiss (from German; pronounced “nice”) is a foliated, high-grade metamorphic rock with a characteristic, banded texture. This texture can be clearly seen in the image below. 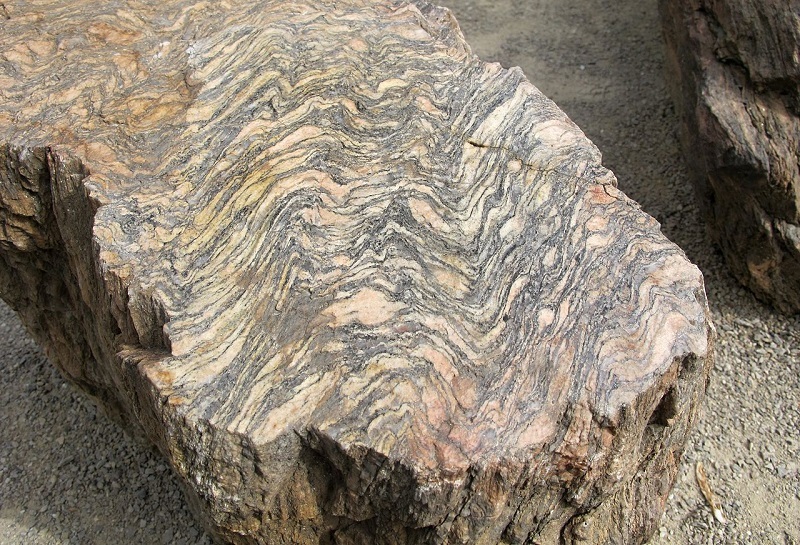 Gneiss can form from many different rocks, and it may contain many different minerals. Like all metamorphic rocks, gneiss forms when an already existing rock (called a “parent rock” or “protolith”) undergoes a process called metamorphism. This process transforms rocks by subjecting them to heat and/or pressure, and the amount of heat and pressure determines what kind of metamorphic rock is formed. To form gneiss, both very high levels of temperature and pressure are required; these conditions will likely be on the order of several kilobars (one kilobar = one thousand atmospheres) and several hundreds of degrees Celsius. These conditions most commonly occur deep within continental crust where the weight of overlying rock creates high pressure and heat from radioactive decay creates high temperatures. Due to the intense conditions necessary to form gneiss, this rock is considered a “high-grade” metamorphic rock. The only metamorphic rock with a higher grade is called migmatite; this rock forms when a gneiss undergoes partial melting due to even higher temperatures and pressures. Other metamorphic rocks such as slate, phyllite, and schist all have lower grades of metamorphism than gneiss, because they endure lower temperatures and pressures during metamorphism. The different colored bands in gneiss contain different minerals; the lighter bands often contain felsic minerals like feldspars and quartz, whereas the darker bands usually contain mafic minerals like amphiboles, hornblende, and biotite. The minerals present in a given gneiss depend heavily upon the protolith itself, and two different samples of gneiss may contain entirely different sets of minerals despite both exhibiting gneissic banding. Many different protoliths can produce gneiss if the appropriate conditions are met during metamorphism. 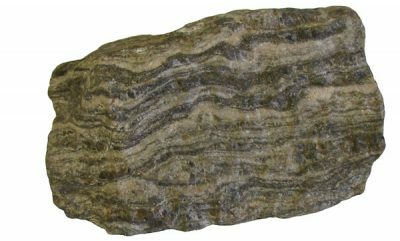 If the protolith is an igneous rock like granite, then the resultant gneiss is called an orthogneiss; see the image below. Conversely, if the protolith is a sedimentary rock, then the end product will be called a paragneiss. The easiest way to identify gneiss is to look for the banding on the surface of the rock. These bands typically exhibit alternating layers of light and dark minerals, and they may vary up to a few millimeters in width. Identifying gneiss can sometime prove troublesome, however, because metamorphism occurs on a spectrum, which causes some metamorphic rocks to exhibit characteristics of multiple types of metamorphic rocks. That different metamorphic rocks can sometimes form and be found right next to one another further complicates identifying gneiss or other metamorphic rocks. Because gneiss forms only at high temperatures and pressures, and these conditions are typically found deep within the Earth, most of the gneiss on the Earth’s surface has been brought to the surface via plate tectonics and associated mechanisms and/or revealed due to erosion and weathering. Gneiss may be found worldwide in rock outcrops, and even regions that have no exposed metamorphic rock outcrops may still have gneiss on the surface due to glaciers transporting gneiss from another area and dropping it on the surface in glacial till. Gneiss can sometimes contain gemstone-quality stones such as garnet, and it may also be used as a building material or provide decorative stoneware for landscaping. Some of the oldest rocks known on Earth are gneisses; scientists have found gneiss from Greenland that is over 3.5 billion year old. These rocks and other metamorphic rocks are therefore important for interpreting Earth history. In addition, gneiss can reveal information about past tectonic events due to the unique conditions needed to form gneiss. If gneiss is exposed in a rock outcrop, for example, then that’s a good clue that that region was at one point buried deep underground. 1. What does “high-grade” metamorphism mean? A. The rock did well on its latest exam. B. The rock underwent low temperature and pressure during metamorphism. C. The protolith contained mostly felsic minerals. D. The rock underwent high temperature and pressure during metamorphism. 2. What causes the banding seen in gneiss? A. Minerals group together and align themselves in bands perpendicular to the stress endured during metamorphism. B. The bands form from stretching due to tectonic events. C. The bands are left over from the protolith. D. Certain minerals only form in bands. 3. Why do minerals recrystallize during metamorphism? A. The minerals melt and reprecipitate during metamorphism. B. Minerals are stable at certain temperatures and pressures, so the intense heat and pressure associated with metamorphism cause them to recrystallize into new, more stable forms at those conditions. C. The pressure associated with metamorphism causes the atoms to press more tightly together. D. They spontaneously degrade into less stable minerals. 4. Where are gneisses most commonly formed?